1 Why Do PPC For Your Dealership? At the heart of any pay-per-click marketing campaign is a sound strategy that includes high opportunity keywords, properly targeted audiences, unique ad text and sleek landing pages. This is no different when it comes to PPC for auto dealerships. You don’t have to run a massive online ecommerce business or sell consulting services online to benefit from a strong PPC campaign. Even your local auto dealership can reap the benefits and drive massive traffic to its business, both online and in person. 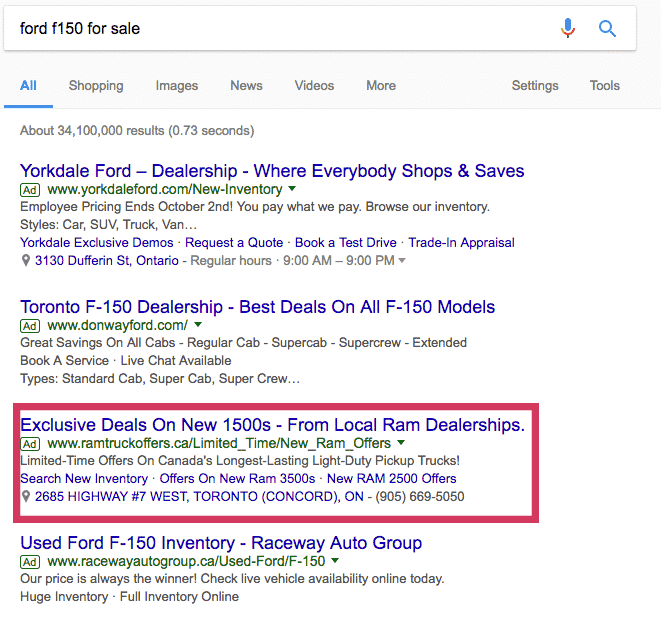 Why Do PPC For Your Dealership? Word of mouth is not enough to thrive in the automotive industry anymore. Your brick and mortar locations need to thrive online because people are simply purchasing products much differently nowadays, and this applies to selling vehicles as well. Wrap your head around this. According to Netpop Research, 90% of car buyers turn to Google for a shorter, more efficient research process. Shoppers take much less time to decide on a purchase than in years past, and on average makes only two visits to a dealership before purchasing a vehicle. To understand this better and build a PPC campaign around it, it is imperative to comprehend the automotive buyer’s funnel. There are five key auto micro moments during the buyer’s process, and they are as follows. These are the questions your buyers are asking when they take their attention to the Internet and away from the physical location. With this information, you can build PPC campaigns that target shoppers at each of these micro moments. The answer is yes, but you are missing out on an enormous part of the online marketing spectrum by only going down this route. A study from Google showed that even if you are No. 1 in the search rankings, you are still missing out on 55% of potential clicks if you don’t also have PPC ads since they will appear above the search results. Want to get started for free? Download your free automotive PPC starter kit. There are many different types of PPC campaigns you can put together, and we will go into detail on five separate campaigns you can run. Each one can be tailored directly toward your target market. These target your brand specifically and include keywords such as your company’s name or website. This allows customers to become familiar with your brand and dominate search engine results pages (SERPs). These give you a bit more control over how your dealership appears online and allows you to push down any competitor’s campaigns who may be attempting to poach your customers by targeting your branded keywords. Most importantly – branded campaigns convert very well! This is because shoppers who are searching specifically for your dealership already know and trust your brand. They don’t have to go through any feeling out process since they have already heard about you from a friend or have interacted with your company before. Here is a chart to give you a better understanding of what keywords to target in your branded campaign. You don’t want to throw stuff at the wall and see what sticks, because that is how you quickly waste money in a PPC campaign. It is important to start out by using preexisting data. Check tools such as Google Analytics, Google Search Console, KeywordTool.io, and even Moz and SEMRush if you have them at your disposal. These will give you a much better grasp of how customers are searching for you. Dynamic campaigns are quite different from your typical PPC campaign in that they are programmatically created based on the inventory in your feed along with keyword and ad templates that you create. The aforementioned Netpop study also discovered that 65% of car buyers search for specific brands and models when buying a car, dynamic campaigns take advantage of this. 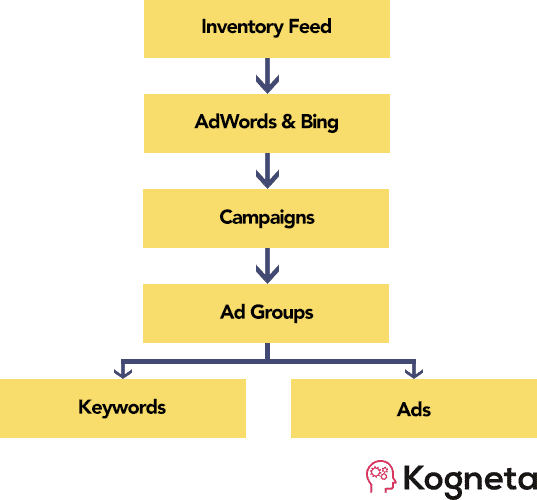 The available vehicles in your inventory feed populate into AdWords and Bing programmatically creating campaigns, ad groups and keywords based on the Make, Make + Model, and Make + Model + Years combinations. Your inventory feed is analyzed periodically throughout the day, which will then start and stop ads based on changes in your inventory, allowing you to save more money on your ad spend. For example, if your dealership has just sold its last BMW, the dynamic campaign will recognize this and stop running all BMW ads. In order to scale your dynamic campaign for all the Make, Make + Model and Make + Model + Year variations templates, keyword and ad templates are used. Keyword templates in dynamic campaigns allow you to target both short and long tail keywords, providing an all-encompassing strategy. The keyword templates you see above are standard examples of what your campaign would look like, divided into your three main campaigns – Make, Make + Model, and Make + Model + Year keywords. Long tail keyword examples for dynamic campaigns might be something like “Honda Civic sales” or “used Honda Civic.” You could also expand to include the city you are located in as well as the name of your dealership. Ad templates work in a similar fashion. You create a template for your Make, Make + Model and Make + Model + Year campaigns and they are programmatically completed. An example is shown above for a Make + Model campaign if you have a Honda Civic and Ford Focus in stock. Exclusive Free Bonus: Download your keyword & ad templates for dynamic campaigns. The keywords you target for competitive brands will look almost exactly the same as the ones from your branded campaign, except you replace your business’s name with your competitor’s! 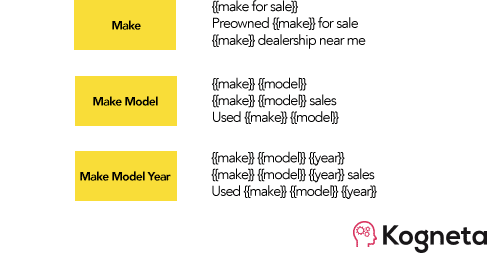 For comparative vehicles ad groups, you will be bidding on make and model keywords that are comparative to the vehicles that you offer, as seen in the breakdown above. The positives of running an effective conquest campaign are obvious. You will be able to cut in front of your competition, stay at the top of the searcher’s mind and generate higher conversion rates. However, there are a few drawbacks. Conquest campaigns will generally have a higher cost-per-click because your click-through-rate will likely not be as good since shoppers are often searching for your competitor. You could also have a low quality score since your landing page may not feature the keywords you are targeting at all. The one thing to keep in mind with the legal caveats is that you should absolutely not infringe on a brand’s trademark. Don’t go after their slogans or catchphrases, as that is where you start to sway onto the wrong side of the fence. As long as you stick to the protocol, as conquest campaigns are standard practice in the PPC industry. Remarketing campaigns target people who have already interacted with your brand at some point. We like to divide remarketing campaigns into four different subsets, which you can see below. Site visitor remarketing is remarketing to people who have visited your site excluding people who have gone to SRPs and VDPs. The reason you exclude SRP and VDP pages is because those are already taken care of in your dynamic marketing campaigns. Visitor remarketing works in a pretty standard trajectory. The user views your non-SRP/VDP page, leaves your site, visits a 3rd party site, then sees one of your ads and converts. Dynamic remarketing shows ads based on the SRPs and VDPs that a person visited in order to convert to a test drive or a purchase. This type of remarketing focuses more on showing people ads for vehicles that are most relevant to them. This is how the dynamic remarketing campaign works, which is a little more complicated. In-Store remarketing campaigns involve showing ads to people who have actually visited your dealership, either just to browse or to test drive. You then show them ads in order to convert a purchase by means of increasing trust and authority. These ads move the needle when shoppers are ready to buy rather than doing research. The in-store remarketing campaign is based upon gathering a prospective customer’s email address, which is then synced with your remarketing list. Once you have their email address, you can show them ads such to build trust. These ads can be display campaigns showing off happy customers, YouTube ads including your staff talking about how great the company is, and things of that nature. The last form of remarketing campaign is post purchase remarketing. This type of remarketing campaign helps turn one-off customers into lifetime customers by showing them some of your add on services such as oil changes, tire rotations, and anything else your dealership might offer. They are designed to make sure a customer doesn’t simply purchase a vehicle and never comes back. The post purchase campaign acts similarly to the in-store remarketing campaign, in that it also involves syncing the customer’s email address to a remarketing list. The difference is that the post purchase ads focus specifically on your dealership’s add on services as opposed to purchasing a car. A great tip to improve your post purchase remarketing is to make sure the ads are run in a timely manner. For example, if you know a customer’s lease is coming to an end, you can warm them up for another purchase by launching the proper ads in their direction. If the customer has this head’s up before you reach out to them, a level of trust will have already been established. The last type of PPC campaign we are going to discuss for your dealership are general campaigns. These are designed to target people who weren’t really drawn in by any of the other campaigns we talked about. It is essentially a catch-all campaign. None of these are keywords that you’d traditionally aim to rank for, but people are searching terms like these more and more frequently. This is exactly where your PPC campaigns come in handy in areas that an SEO strategy would not. Dominating a search query such as “Best auto dealership near me” will help you get the most out of your PPC campaign, and help you show up in local search above all of your competition. Each of these five types of PPC campaigns will help your dealership tremendously, and when run in unison, you will come at your target market in every way possible, leaving no stone unturned. SEO is great, but the PPC is the icing on the cake to help you drive real, tangible results. With the right campaign, your auto dealership will have a massive increase in both online and in-store traffic.